The Welsh Springer Spaniel is a descendant of the English Springer Spaniel, who is the founder of all the English hunting spaniels. It is a compact, medium-sized, working dog. The slightly rounded head is in proportion to the body with a slightly domed skull. The fairly square muzzle is about as long as the skull, but never longer. The nose is either black or any shade of brown with well open nostrils. The Welsh Springer Spaniel is loyal and willing to please. Happy to be with their family, is good with children, and loves to be included in activities. 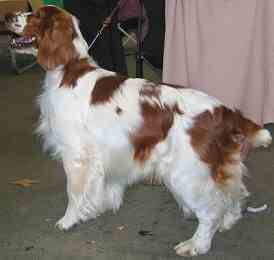 They are smaller with a lower energy level than their English Springer ancestor. They must be trained early to hunt, so they learn to use their skills in a positive manner, listening to commands and learning not to wander. The Coat of the Welsh Springer Spaniel is fairly easy to maintain and regular brushing with a stiff bristle brush will be enough. Pay extra attention however, when the dog is shedding. Bathe or dry shampoo only when necessary. Check the ears regularly for grass seeds and signs of infection. Trim the hair between the toes and keep the nails clipped. This breed is an average shedder. Prone to hip dysplasia, epilepsy and entropion. The Welsh Springer Spaniel is an energetic and lively dog that needs plenty of regular exercise, including a daily, long walk. They will greatly enjoy running off the leash in a safe area. Without enough exercise, these dogs will become bored, fat and lazy and are more likely to develop a wide variety of behavior problems. Welsh Springer Spaniels are independent, and needs an owner who displays leadership or they may not listen to known commands and can become over protective. Dogs who do not have humans who are consistent pack leaders, can develop protective tenancies. Can be reserved with strangers and should be socialize well to avoid timidity. They are sensitive to the tone of one\'s voice and will not listen if they sense that they are stronger minded than their owner, however they will also not respond well to harsh discipline. Owners need to be calm, yet possess an air of natural authority.